On the first day of the Mercury Retrograde, February 6, I found myself deep in my attic, surrounded by piles of junk: old bedsteads, mysterious boxes, a couple of boogie boards, a broken dollhouse even. I’ve been meaning to clear out the attic since last year, but every time I thought about going up there I just felt overwhelmed by the task. Some of the boxes up there are literally too heavy for me to lift, and the piles of stuff have become unruly, precarious, threatening even. So there I was in my unruly attic, still in pyjamas, having trapped myself in a corner behind some boxes and an ancient stereo, when I spied my missing books, my missing knitting needles and a tumbling bag of baby shoes all at once: treasures. Suddenly, it was easy. I found I had almost superhuman strength. Boxes were lifted and tossed aside, crates levered… a space was clear in minutes. Mercury Retrograde in Pisces: exploring detritus in the unconscious. Pluto opposite Jupiter (Pisces ruler): throwing out rubbish. I cleared half my attic in a single morning. A task which has been weighing down on me for more than a year was accomplished in a trice. Clearly, the time was right. Now an attic is a metaphor for the mind. Mercury, the planet of mind and communication, will go backwards through the first few degrees of Pisces until February 13, and then through Aquarius until February 28, when the messenger will turn forward again. Pisces is the unconscious mind and Aquarius is the conscious mind. Pisces is poetic, intuitive, emotional. Aquarius is rational, logical, Spokian. First we sift through our emotional attitudes, our memories, dreams, imaginings; then we turn to the systems of thinking that we may have been holding on to for years. Everything is up for re-evaluation now. And some of it should be thrown down Pluto’s drain. Click here to see Rick Levine‘s explanation of this month’s Merc Rx and more. And the last few weeks of the North Node’s stay in Scorpio will help the process along. (The past 18 months in my house have been a slow, gradual purge of STUFF. The physical stuff I do with great delight and satisfaction; the emotional and mental is harder). I am correcting the dates on this — Merc Rx ha ha — I put March instead of February by mistake. And did you come across a few old secrets ? (see picture !). I, too, am finding this time to be like a divine appointment with our subconscious minds and the way we are wired in ways we aren’t aware of for both myself and clients. its frightening to ‘peer in’ and we should be proud of making the effort to be open to the process. I wanted to write a post on Nancy Drew but I can’t find the date of the first publication. It’s so interesting that she is a product of many pens. 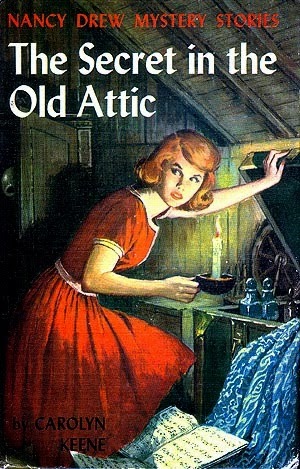 I would love to see a post on Nancy Drew–she is one of my favorites!